In the classic novel, Nathaniel Hawthorne writes, “It may serve, let us hope, to symbolize some sweet moral blossom that may be found along the track”. 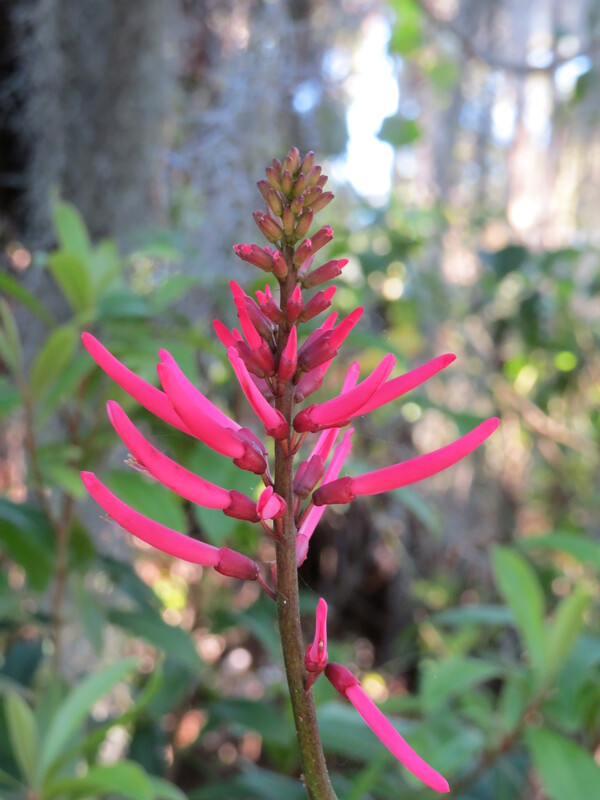 The scarlet “letter” at the Oslo Riverfront Conservation Area entrance is the beautiful blossoming of coral bean (Erythrina herbacea. Also known as Cherokee bean, cardinal spear, and cardinal bean, this plant flowers during the winter or early spring. Flowering time from plant to plant is quite variable. Some plants drop all of their leaves prior to flowering, but other individuals do not do so. Now is the time to look for flowering coral beans throughout Indian River County. Hummingbirds and butterflies will be looking for the flowering coral beans, too.